New York — The grand opening is drawing close for the world’s largest modular hotel, the CitizenM located at 189 Bowery in Manhattan. Creation of the highly unique and ultra-trendy project was orchestrated by one of the leading construction firms in the U.S., New York, New Jersey and Florida-based Rinaldi Group. Modular construction is one of the fastest growing real estate trends in the country following its major success in Europe as well as Asia. The CitizenM hotel is expected to feature roughly 300 rooms, all assembled using sealed, fully-furnished, prefabricated units. 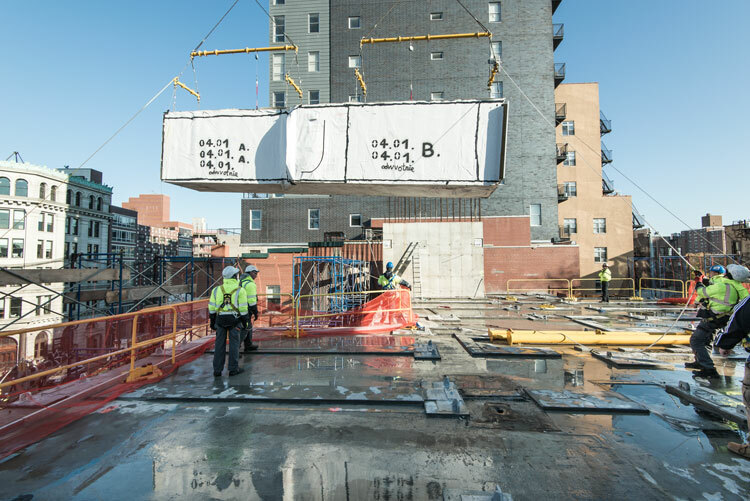 Among the many advantages to modular construction are the saving of considerable cost and time which particularly in Manhattan, limits street closures, keeping them clear and safe for pedestrians. Modular construction methods reduce a project’s completion time by as much as 50 percent, allowing companies, residents and guests to occupy the space far ahead of the typical building schedule. The modular construction industry is experiencing dramatic growth across the U.S. In recent years, the Permanent Modular Construction or PMC industry rose from approximately $2 billion in annual sales to over $3 billion and currently drives roughly $6 billion of annual construction industry activity. CitizenM will offer an exterior and interior rooftop bar and lounge called CloudM with sweeping 360-degree views of the Manhattan skyline. There will also be a fitness center, a double-height lobby, lounge and café at the property.